Edelbrock Steel Belt Tensioner Brace For 2005-2010 Mustang GT  : Supercharger Superstore, Your Online Source for Vortech Superchargers, Paxton Superchargers, Procharger Superchargers, Magnacharger Superchargers and Techco Superchargers! This new belt tensioner brace is intended for use on 2005-10 Mustangs and 2004-10 F-150 trucks with an aftermarket supercharger installed. The stock belt tensioner is cast aluminum and has been known to bend and even break under extreme driving. The Edelbrock Steel Belt Tensioner Brace is an inexpensive solution to this common problem. It simply bolts on to your stock tensioner and prevents any deflection of the cast arm. 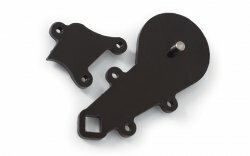 Already included with E-Force supercharger kits #1580, #1581, #1582, #1583, #1585 and #1587.